I kid you not... right there in the dictionary was a picture of Manny Ramirez's face! Ok, all joking aside... When Manny is happy, he is legitimately one of the best offensive ball players I've seen in my entire life. But ask Red Sox nation how Manny gets when Manny isn't happy... Manny gets discontented, Manny grumbles about everything, and Manny destroys a clubhouse. Manny almost single-handedly ruined the Red Sox, but Manny turned around and promptly made the Dodgers a legitimate contender for the World Series when Manny was traded. Manny was batting .348 with six homers and 20 ribbies in the first 27 games of the '09 season before Manny was banned from the LA's next 50 games, and Manny was the biggest reason why the Dodgers started the '09 season with the longest home winning streak to start a season in baseball history. Manny liked seeing Manny's name in headlines. Manny always wanted to be front page news. Manny always wanted thing Manny's way. Now Manny is getting a 50-game sabbatical after testing positive for a banned substance, most likely HCG, human chorionic gonadotropin, a female fertility drug used to lower testosterone levels. MLB added HCG to the list of banned substances last year, knowing that former steroid users could be taking the drug to regulate testosterone levels after quitting steroids that increased those levels cold turkey. Congrats Manny... You likely cost the Red Sox a chance of winning the World Series last season, and now you've cost the Dodgers a chance at winning the NL West crown. Just for that, I'm done calling you "Manny." Though Ramirez swore up and down that his suspension had nothing to do with steroids, it's pretty evident that he was using steroids if the substance that he tested positive for was indeed HCG. The black eyes that baseball is suffering in this, the "Steroid Era" are starting to get a wee ridiculous. First it was Mark McGwire, then people pointed fingers at Sammy Sosa, and Roger Clemens, and Rafael Palmeiro, and Alex Rodriguez, and now, finally Ramirez. These are some of the greatest names, not only of our generation, but of all-time. Ramirez is arguably one of the best Red Sox of all-time, and that's a lot of history you're going through to be placed in with some of those hallowed names. The difference between the rest of these names and that of the Dodgers' left fielder is that the freak show wasn't effecting teams on the field. The Yankees, Astros, Blue Jays, and Red Sox all succeeded with Clemens on the mound. McGwire still led both the Cardinals and Athletics into the postseason on several occasions. Sosa and Palmeiro both were on winning teams. We won't discuss A-Rod and the luck he's had in the clutch... but it's hard to blame a guy who has won the MVP Award on a last place team for his squad's failures. Ramirez is a cancer. No matter where he goes, he will always be a distraction. 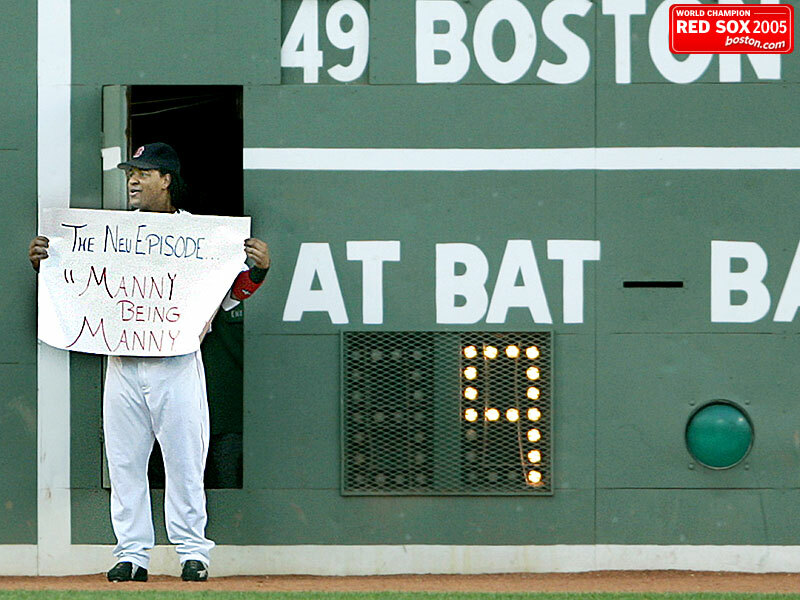 Now the Dodger faithful are learning about Manny Ramirez what Red Sox fans have known for years. Manny will always be Manny.